Sara Scoles is a science journalist and author. A contributor at Wire Science, Sara has also written for The Atlantic, Motherboard and Popular Science. Sara has written a new book called Making Contact, and it’s about a true pioneer and innovator in the search for extraterrestrial life. Listen, Ladies (LL): Hi Sara, thank you so much chatting with “Listen Ladies.” I read that you settled on being a research astronomer when you were just four years old. What attracted you to science at such a young age? LL: Let’s get into your book Making Contact. First of all, people who have seen the movie Contact, with Jodie Foster, might have more knowledge about the subject of the book than they think. So, who is Jill Tarter, and why did you want to get her name out there? SS: Jill Tarter is one of the founding scientists of what’s called the “Search for Extraterrestrial Intelligence,” or “SETI,” which is mostly looking for radio signals that appear to come from civilizations beyond our planet. Jill Tarter was one of the first people to get on board with NASA’s efforts to do that, and she went on to lead a number of private projects afterward. Indeed she was the leader of the field for over forty years. When Carl Sagan wrote the book Contact, he used Tarter as a model for the character Ellie Arroway. In the book, Arroway looks for signals representing extraterrestrial intelligence, which is exactly what Tarter did all day long before she retired (and what she still does most of the time even now). In both the book and the movie Contact she finds these signals and discovers this alien civilization. Real Jill Tarter hasn’t done that yet, but you know, there’s still time. LL: At one point she nearly loses her scholarship in college. Could you explain what happened there? 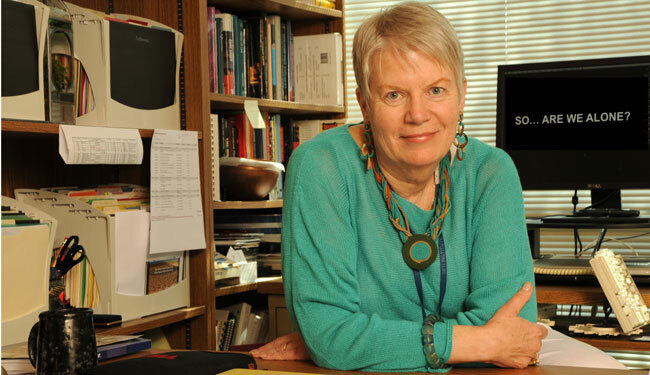 SS: Before she even went to Cornell, Jill Tarter applied for a scholarship that was for descendants of Ezra Cornell, the founder of the school (her middle name is Cornell). And she was informed as politely as you can be of such a thing that the scholarship was for male descendants only, and so she couldn’t have it. But then the school came though with a private scholarship from Proctor and Gamble for the full five years of the engineering physics program. They even let her finish the program in four years so she could be faster than everyone else, which she liked to do. When she was partway through her school she married a man named Bruce Tarter, at which point Proctor and Gamble assumed that what she wanted most was her “MRS” degree, not her physics degree, and so they said, “Okay we are going to take [the scholarship] away from you.” Naturally Tarter thought that was absurd. She thought, “This is not fair. I’ve only ever done really well in my classes. What does my getting married have to do with anything?”Luckily a man named Dale Corson, who was higher up than her at Cornell, agreed with her and went to bat for her with Proctor and Gamble. That was how she got her scholarship back.